On Jan. 20, 2017, President Trump was sworn in as the 45th President of the United States. 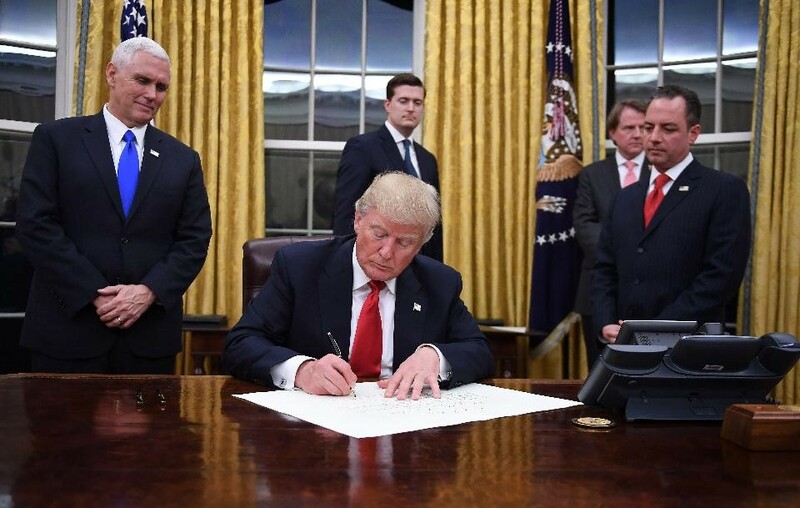 President Trump wasted little time addressing campaign promises by way of Executive Orders (EOs). Since taking office, President Trump has issued several EOs; however, we believe one EO in particular will have the greatest impact on academic dentistry: Protecting the Country From Terrorist Attacks by Foreign Nationals. This EO affects students, faculty, researchers and other individuals who travel from the countries specified in the EO and who are nationals or dual nationals of those countries. Below we provide an overview and analysis. Executive Order: Protecting the Country From Terrorist Attacks by Foreign Nationals. This EO temporarily bars people from seven predominantly Muslim countries from entering the United States and creates an indefinite suspension for Syrian refugees. Furthermore, the EO suspends the U.S. Refugee Admission Program for 120 days and the Visa Interview Waiver Program, and limits the number of refugees that can enter the U.S. in FY17 to 50,000. The EO effectuates an immediate 90-day suspension of entry of individuals from Iran, Iraq, Libya, Somalia, Sudan, Syria and Yemen. Refugees from Syria are completely barred from entry into the country. As of Jan. 27, people who have either nationality or dual nationality from one of the seven specified countries are barred from entering the United States for 90 days and will not be granted visas. It should be noted that the EO only addresses entry to the United States; it does not direct the removal of those already present but it does mean that individuals from the designated countries might not be able to reenter the United States if they leave. In response to the EO, several legal challenges were filed and granted around the country, including an Emergency Motion for Stay of Removal by the District Court, Eastern District of New York. U.S. Judge Ann Donnelly ruled in favor of the petitioners and stated that they had a “strong likelihood of success” in establishing that their removal “violates their rights to Due Process and Equal Protection guaranteed by the United States Constitution.” The temporary Stay suspends the EO as it applies to “removing individuals with refugee applications approved by U.S. Citizenship and Immigration Services . . . holders of valid immigrant and non-immigrant visas and other individuals from Iraq, Syria, Iran, Sudan, Libya, Somalia, and Yemen legally authorized to enter the United States.” In essence, the ruling does not mean that people who entered the country and are being detained at airports will be automatically released; to the contrary, the ruling means that they cannot be deported but they are still subject to detention. In addition to the New York ruling, a federal court in Washington state issued an Emergency Motion for Stay of Removal, forbidding travelers being detained there from being sent back to their home countries. And, a federal court in Virginia issued a Temporary Restraining Order allowing permanent residents to have access to legal counsel while being detained at Dulles International Airport and forbidding them from being removed from the United States for seven days. Massachusetts went further in issuing a Temporary Restraining Order, stating that the government should notify travelers who have been affected that they should feel free to enter the United States through Boston for the next seven days. Finally, the State of Washington filed a federal suit, Complaint for Declaratory and Injunctive Relief, challenging the Trump Administration’s immigration ban and detailing the EO’s personal and economic impact on high-tech, higher education and research, among other effects, in the State of Washington. The suit seeks a favorable ruling from a federal judge to declare much of the EO as “illegal and unconstitutional.” Along with the federal suit, the State of Washington also filed a Temporary Restraining Order that will block the EO from being enforced at airports across the country. The above law suits are subject to expedited hearings in the coming weeks. We anticipate more lawsuits in the coming days and weeks.